Is The UK Government Banning Mainstream Media From Reporting On One Of The Most Important Stories Of The Year? I often ask myself where our society would be without social media these days. It’s become the way to keep in touch with friends and family, see hilarious (some not so much!) 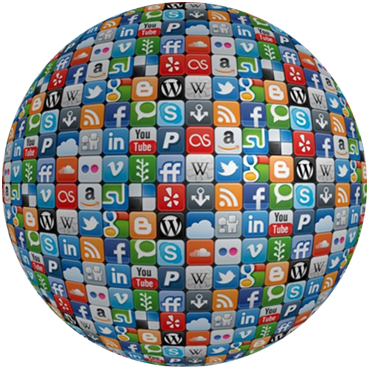 pictures and videos, promote businesses films and music….. Social media has also become an invaluable tool for free speech. Something that the mainstream media (TV, Radio, Newspapers) seems to have lost its grip on a while ago. In my previous article I briefly talked about how our media is paying little or no attention to the storm surrounding Jeremy Hunt’s atrocious attack on NHS staff. That was over the weekend, and I honestly expected that when I woke up Monday morning it would be the top story on most, if not all respectable news outlets. Boy was I wrong! 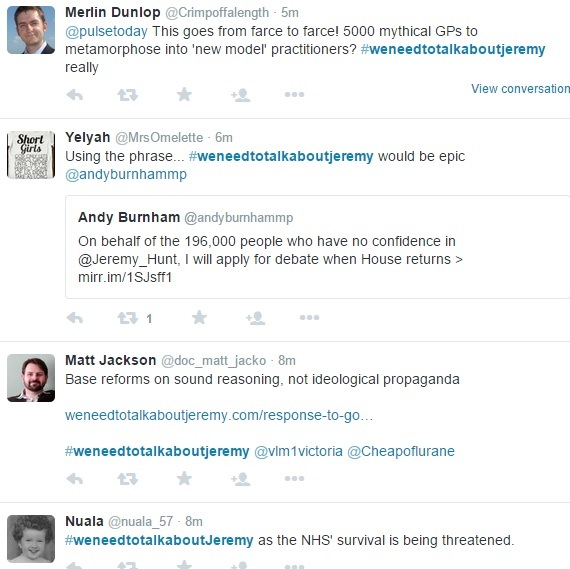 The reason I had such high expectations was because on Sunday 26th July #WeNeedToTalkAboutJeremy came to life on Twitter. Similar to its predecessor #ImInWorkJeremy, this hashtag was designed to bring together all the thoughts and feelings of the Health Secretary’s latest attempt to undermine our heath service, only this time it was more open to everyone else, as well as doctors and nurses. And boy did this thing come to life! Just one look using this hashtag lead feed showed you exactly what the people of this great country think of a man in charge of the NHS who has no qualifications to be doing so. There was much made of the petition to call for a vote of No Confidence. Awareness was rising. The nation was showing huge interest in this story. As I sit here even now, people continue to spread the word. So if social media was alive and buzzing, what was the traditional mainstream media doing? Answer: NOTHING. On the radio, TV, websites affiliated with these broadcasters, nothing. And I don’t understand why. Surely the job of the national media and news companies are to report on stories that are in the public interest of this country? 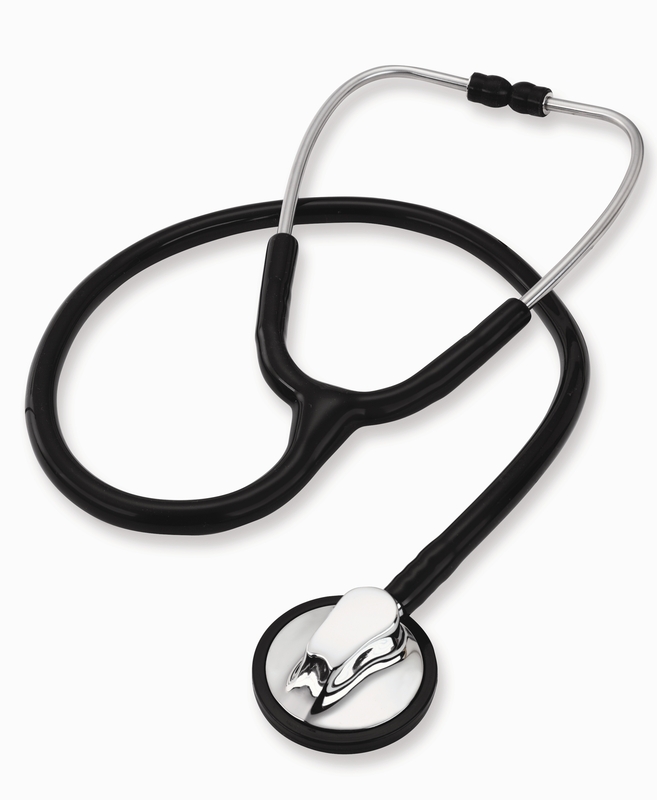 I can think of no other story, right now, that is more in the public interest than the future of its health service. Why are they not talking about this? The only mainstream media outlet that I have seen talk openly on this story was Channel 4’s The Last Leg, where Its host Adam Hills went off on one of his trademark rants calling out Mr. Hunt for his remarks. During this you could practically hear the entire NHS workforce applauding and cheering ‘finally, someone gets it. At last people are listening’. The weird thing is that what usually happens after one of Mr. Hills rants is they are uploaded to the shows YouTube channel. At the time of writing this, that brilliantly succinct rant has not been uploaded. The biggest disappointment for me in all this has been the BBC. The British Broadcasting Corporation has said not one word. There has been nothing on their TV or radio stations, or on their website. We all know that the BBC has its own issues with the current government, especially ahead of the Royal Charter review, but if a corporation designed to entertain and inform is not going to report on one of the most important and relevant stories in the country right now, then what’s the point of its existence? And I’m saying this as someone who loves the BBC. Sherlock, Doctor Who, Fiona Bruce, Jeremy Vine – these are all regulars in our house, and I dread the day that the Beeb is taken from us. Why they have not reported a word of a story that is practically on their doorstep is beyond me, and if I was a conspiracy theorist I would be saying that the Government is stopping them from doing their job , gagging them. But that couldn’t be happening, not in a free and democratic country, right? Screenshot of BBC News Website (Health) 00:36 Tuesday 27/07/2015. Also no mention on Top Stories or UK News sections. There has been some signs of hope in all this. 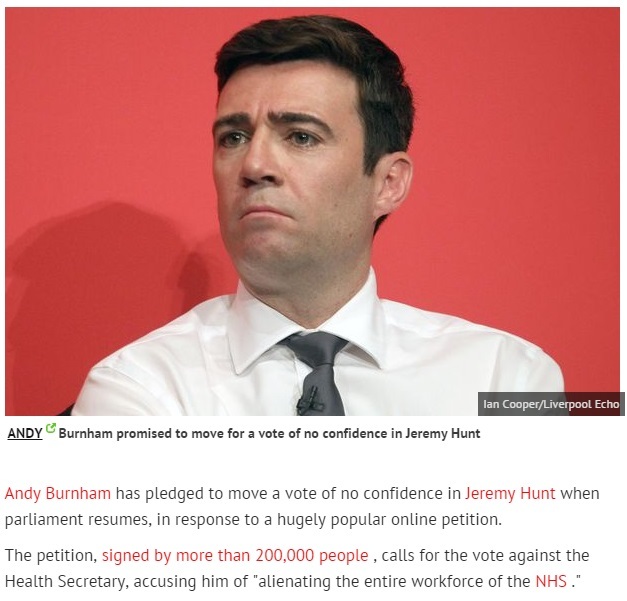 The Mirror newspaper has posted a story just recently on Labour Leadership Candidate Andy Burnham, and his intent to pledge a vote of No Confidence in Jeremy Hunt. This is the first national newspaper that has openly mentioned not only the petition, but also the 200,000+ signatures. Interestingly the Guardian have also published a story on Mr. Burnham, ahead of the same press conference on Tuesday 28th July. In their story they make a point of saying that Mr, Burnham, currently Shadow Health Secretary, will be talking on the 70th anniversary of the year that a Labour government that created the NHS came in to power. It then quickly goes on to dissect Mr. Burnham’s role in the Labour leadership battle (which is totally newsworthy) but mentions nothing of the fact that he will be voting No Confidence in his Conservative counterpart when parliament resumes. Once again, a media blackout on the part of the story that affects an entire nation. The media will always have an agenda, an angle when it comes to reporting a story. This is something that, as we have become more media savvy over time, we have also come to accept. What is unacceptable is when the traditional media say nothing on a story. When they just keep quiet on a subject like this that is so important to everyone, you have to wonder why. Is there some kind of conspiracy here? Whatever the answer it appears that TV and radio (and much of the printed press) is not up to doing its job, so it’s down to us. We must keep going on social media – our tweets, posts, links etc. are working. The petition is well past 203,000 signatures, and it will only continue to grow if we keep chatting about it. Keep the pressure on, and this Government has to listen. After all, we elected them in to power – we gave them their jobs, they work for us. Not for themselves or the highly profitable private companies they’re chums with, us. These people are our representatives and so far they are not listening to us (Andy Burnham accepted). If we don’t ensure that this latest attack on our health service is taken seriously, there will come a day where you won’t be able to go to A&E without a credit card. A day when new parents won’t be able to walk out of a maternity ward with their baby without paying a charge at the exit. That’s not us, that’s not what the UK is. Not long after this post was first published, at 9am this morning The Last Leg finally uploaded that rant of Adam Hills towards Mr. Hunt. It is unclear why it took three and a half days to do so, but finally more attention is being drawn to the attack of the Health Secretary on the Health Service. In the rest of TV land, and in all of radio, silence. Thankfully, as we see here, cracks are beginning to show in the media blackout. 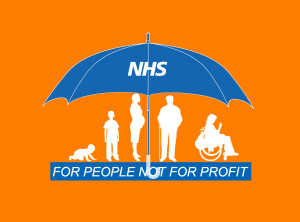 Word is getting out, people are talking, and it will be a grave social injustice if after everything I have talked about, at the very least, Jeremy Hunt is not removed from his post as Secretary for Health.